Kodak launched its first camera in 1889 and with it brought photography out of the domain of the wealthy and made it accessible to the masses. 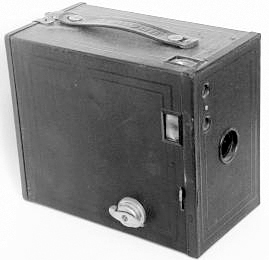 The design was a huge success and became an archetype for other manufacturers who soon began making box cameras of the same design. The cameras were light and portable and came with a roll of film which could be loaded by the photographer himself. Before this, the photographer had to use glass photographic plates and were responsible for developing the film themselves. These cameras came preloaded with film with 100 exposures. After all the shots were taken the entire camera was sent back to the Kodak Company in Rochester for processing.The film was developed, printed and a new roll of film was loaded in the camera. The print came as a round picture of 2.5 inches diameter. These cameras were responsible for popularizing photography among the masses and eventually paved the way for greater technological advancements in the field of photography.